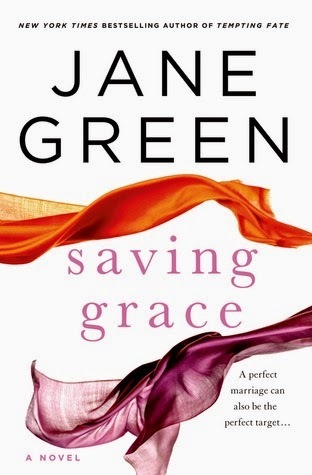 As a long time fan of Jane Green, I have to say that Saving Grace is my least favorite of her books. That isn't to say that is was bad; far from it but it definitely did not resonate with me like many of her other books have. This was possibly due to the fact that I really could not identify with the main character, Grace. The story was somewhat heartbreaking and disconcerting. It is story that could happen to many people and yet felt somewhat soap opera-ish to me and not so realistic. I feel like Grace's character was weak and not a person I would like in real life so I definitely had my issues with her and what I found to be her numerous faults. She irritated me with her naivete and plain lack of common sense. I truly wish that she would have stood up for herself more, though I can understand the difficulty of her situation. I wish that the issue of abuse would have been addressed somewhat differently as I feel there was a real opportunity there. The story was quite lengthy and took a long time to build up some momentum and then just sort of chugged along to the ending without me feeling any satisfaction from a great story with an ending that I loved. The book itself was well written, as in it flowed well, but I kept waiting for something more and hoping for something more. Sadly, I was to be disappointed but this will not dissuade me from reading Jane's next book as she still remains one of my favorite authors.